Happy New Year everyone! Tomorrow marks a big milestone for me – for those of you who know me, you know what that means. The anticipation of tomorrow was one of the reasons why I started this blog to begin with. Time was running out for me to finish things on my list…the blog being one of them. The purpose of this blog was for many reasons – to document recipes, especially my family recipes, to write about food, and to share my passion with others. I wanted this to be a blog about food, not about me or my family – and for the most part I think I have stayed true to that. Every once in a while you get a glimpse into my crazy life, but for the most part – I just talk about my love of cooking and food. I love cooking for many reasons: it calms me to be in the kitchen, I love eating, but most of all, I love sharing what I make with others. There is nothing that makes me happier than to see other people smile when they eat something I have made. It almost gives me more pleasure than eating myself…which definitely helps me fit into my jeans. Well – here’s to many more blog posts about cooking, baking and food. I will definitely be drinking to that tomorrow night at my favorite restaurant. I think everyone knows how to make banana bread – everyone has their favorite recipe that they like. The truth is, when your bananas get too ripe, what else can you do with them other than bake? Sure, you can make banana muffins – but banana bread is just a little quicker. What amazes me though is the varieties of banana bread out there – and even when you do find a recipe that is similar to yours – how different the end result can look. My mother’s recipe is very simple and produces a very pure (in my mind) taste and texture. It is not too dense, but not too fluffy either – in my mind it is perfect. With 1/3 cup oil per loaf, the bread is not too greasy either. I have made this recipe with chocolate chips, and that tastes great as well – so feel free to get creative. This bread freezes really well – just wrap it in plastic first, then in foil. Let it defrost on the counter, and you will be amazed how delicious it is. Pre-heat oven to 350. Mash bananas with a fork and set aside. Mix oil, sugar, milk, vanilla and eggs well. Add mashed bananas. Mix dry ingredients in a small bowl, and add to banana mixture with nuts (optional) until just combined well. Pour into 2 greased and floured 9 x 5″ loaf pans. Bake for 40-45 minutes, or until a toothpick inserted in the middle comes out clean. Remove from pans while still warm and wrap with plastic. How many cups or what weight of bananas did you add. the amount of banana added to the recipe can make a dramatic difference in the final product. I alway select banana bread recipes with a given quantity and not “4 ripe bananas”. Bananas locally range from 3oz to 7oz. So, it would be helpful to know how much banana you added. thanks. I would go for approximately 7 oz. per banana. 7 oz per peeled or unpeeled banana? I’m about to make it! I would use 3 medium bananas, and you will be fine. Mmmm. I remember the banana bread you brought us when we moved in! I’m definitely making this…just waiting for those bananas to ripen! I made this recipe today, substituting chocolate chips for the chopped nuts. It’s more like cake than the banana bread I usually make, and I love it. Thanks. Oh my! I just mde it andit was delish! I used 1/3 c of regular milk and 1/3 c of coconut milk, and I sprinkled in some coconut flakes…very nice crispy top adn a nice soft, almost spongy middle. YUM! Thank you so very much for the recipe. I made this last night and split it between a loaf (that I froze for later) and a dozen muffins (that I took to work with me this morning) and it WAS perfect! I wish I would have had some walnuts on hand, but alas, I didn’t. Despite the lack of nuts, they were great! Next time I’m going to try substituting applesauce for the oil. Thanks, again! I made this and my mum said it was as near to perfection as anything (well any banana cake) she’s ever tasted. I sprinkled granulated sugar on top for more of a sweet crunch! That makes me so happy – thanks Ruth, so glad you loved it!! Yum; the ingredients and proportions are very close to the way *my* favorite recipe reads (which I got from a church cook book over 20 years ago); I am anxious to try this variation! Gorgeous picture; the crust looks absolutely perfect. wow! i just made this and it’s really the best banana cake… although i halved the recipe cause 2 loaf pans is too much… but really, i love this… i added chopped walnuts which made this really fantastic.. this beats the recipe that i used and found on youtube… thanks a lot for the recipe..
You are so nice, I am so glad you liked it!! My mother will be very happy. I absolutely loved this banana bread. Out of 10 million banana breads out there, I feel fortunate to have stumbled upon yours. Thanks! Thanks so much, I’m so glad you liked it – thanks for the link backs too!! More good recipes from my mother to come!! I stumbled upon this receipe while looking for the Cooks Illustrated, and I thought to give it a try….before Christmas. After putting in the oven, I read the comments and I am very curious about this bread, as many commenters referred to it as a “cake”. The batter did seem abit cakey, I’m sort of used to something slightly heavy, with enough body to last you the first half of a Thanksgiving day game, kinda heavy! However everyone…did…love it! I probably will to. It’s still in the Oven…smells damn good. I’ll report back. OK….listen….this bread, not cake…..can go anywhere with me, anytime. I’m usually not that easy to please! You just made my day – I made two loaves over the weekend, and my husband was just commenting on how this was just the best bread ever – thanks so much!! And also? Amazingly, the bread is just as good after its been frozen! I froze half a loaf back now almost five months ago when I made this — wrapped tightly in two layers of plastic wrap, and then in a freezer bag. I defrosted it the other night and it was still fantastic. Its a banana bread miracle! I am so glad you posted this – I am still amazed at how good it is after being frozen!! I thought the banana bread recipe I had was good… This one is way better. Sweet and delicious! Thanks so much for this recipe. I made it yesterday and it’s absolutely delicious. It will definitely be the standard banana bread recipe around here. Cheers! 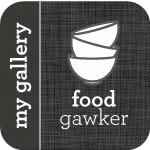 Not at all – your pictures are beautiful, and the bread looks amazing!!! In your intro you refer to a 1/3 cup of oil, but in the ingredient list, it says 2/3. May I ask what amount to use? Or do they both work well and you were offering a lighter alternative? You can use either, I am not home so I can’t check for sure, but I think you are safe with either. Just checked – it is 2/3, but I think you are fine to use either. I made this today and loved it but my loaf didn’t rise in the middle, any idea what I may have done wrong? Thanks. There could be a lot of reasons – maybe the baking powder or soda has gone bad, or the flour? Was it cooked all the way through? I hope you still check your comments, because this is the best recipe ever! 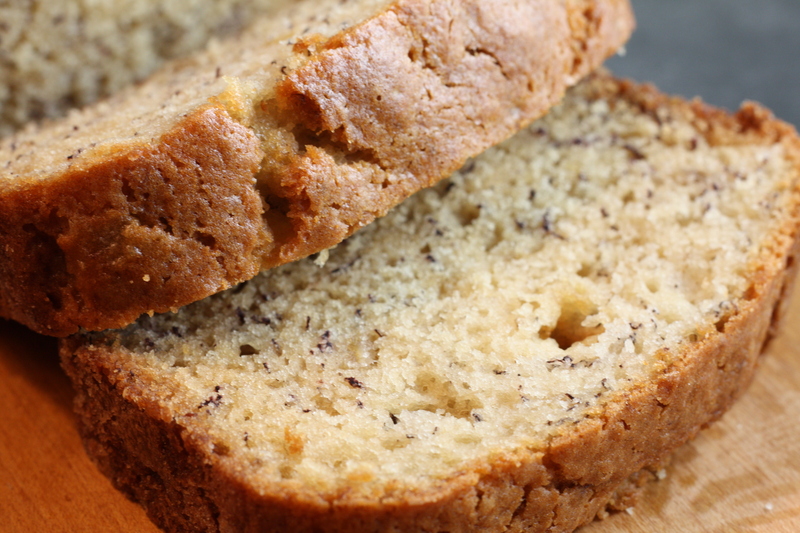 I have made it many times and it is my go to recipe for banana bread. Thank you! Thanks Monica – yes, I definitely still check. So glad you love it as much as I do! you aren’t already ;) Cheers!